We went to Paris to sample the exotic masterpiece. When Refined Marques owner Ahmed got in touch to ask if we would be willing to fly over to Paris in order to check out the Pagani Pearl up close and personal, we didn’t hesitate. Having tracked the Huayra Pearl since its creation, the chance to spend some time cruising around the beautiful cobbled streets of Paris in one of the most exclusive cars in the world was impossible to resist. Memories of the Pagani factory in Modena, Italy, were also fresh in my mind, but I needed another fix. Refined Marques is where the super wealthy, the VVIPS of this world, go when they want something no-one else can get. And that’s where the owner of the Pearl went to get his dream ride. The client had some exacting demands of the car, something Horacio Pagani has been used to dealing with ever since the Zonda broke cover. Stunning pictures have been taken of this car, but nothing compares to seeing it in the flesh. At the agreed time, the Pearl pulled up outside our plush hotel and was instantly swarmed by passersby. Despite Ferrari F12s, Lamborghini Aventadors and other exotics being in the vicinity, the Pagani was getting all the attention. That that turned out to be a recurring event throughout the day. The owner of the Pearl, a Saudi sheikh, entrusts the hypercar to just two people, so while I wasn’t able to drive the car, I was content enough to be taken on a tour of one of the most beautiful cities in the world in one of the most beautiful cars in the world. It was hard to take in the sights when so many features in the interior were demanding my attention. The switchgear, gearbox, even the air vents, are beautifully finished with an artisanal quality worthy of the Paris Museum of Modern Art. Which is why I insisted on regular pit stops. That, and to take as many opportunities as possible to swing open the gullwing doors to the delight of awe-struck Parisians and tourists. Cruising down the Champs Elysees to the Arc de Triomphe, obligatory shots of the Pagani with the Eiffel Tower in the background followed. Fondation Louis Vuitton, a spectacular building by Frank Gehry, was another fitting place to pose with the Pagani, and we ended the tour at the Four Seasons George V. This is where Russian oligarchs, Middle Eastern oil barons and society’s elite show off their rides outside the hotel and where the supercar spotters of the French capital hang out en masse. The Pearl took 18 months to build with Pagani spending a further six months returning it to full health after an accident in the French capital. From every angle, the Pearl boasts unique features that captivate those that know Pagani and anyone appreciative of a rolling work of art. The rear wing is reminiscent of the split wing design of the Zonda S, the roof air intake is inspired by that on the Zonda Revolucion, while aerodynamic updates were also made to improve downforce, lateral G-forces and ride quality with new air intakes and rear diffuser. The entire body of the car is finished in naked carbon fiber, a striking blue dominates with touches of black for the aero components. Combining elements from the Huayra coupe, Huayra BC, Zonda S and Zonda Revolucion, the Pearl utilizes the motorsport-derived carbo-titanium monocoque chassis and suspension from the BC, complete with an all-new 7-speed AMT automated manual gearbox by Xtrac. In developing the BC, Pagani managed to shed 132 kg, weight-saving measures that were also applied to the Pearl. The new state-of-the-art composite material that Pagani created for the Huayra Roadster – a blend of carbo-titanium and carbo-triax – also features on the sublime supercar. But it’s what you can’t see that is arguably the most amazing thing about the Pearl. 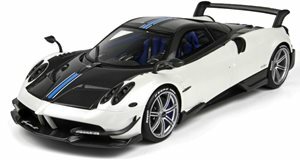 Like the 20 Pagani Huayra BC models slated for production, power comes from an AMG-built twin-turbo V12. However, instead where the BC develops 789 hp and 737 lb-ft of torque, the V12 in the Pearl was heavily modified with reworked turbos, a larger radiator and a host of other changes. As a result, it boasts an output of 1,350 horsepower and is capable of sprinting from 0-62 mph in 2.2 seconds and from 0-187 mph in just 14 seconds. There were a couple of opportunities to test the accelerating prowess of the Pearl. And I can tell you this thing is off the scale. It is quick. Like Rimac Concept_One quick. Having sat shotgun in the electric hypercar at the Goodwood FOS earlier this summer, I can say quite categorically that the Pearl is just as quick off the line. But where the Rimac brings on the power with eerie silence, the Pearl does it with 12 cylinders of ear-splitting Italian music. The Pagani Pearl is a worthy member of the top supercar strata, where only cars that combine exquisite looks, hypercar performance and ultra-exclusivity belong. Spending time with this very special car was a privilege and we have to thank Refined Marques for making that happen.